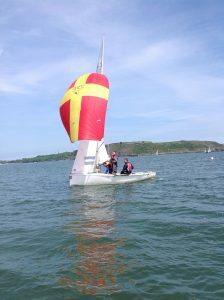 Two new boats joined the club National 18 dinghy fleet over the last number of weeks . 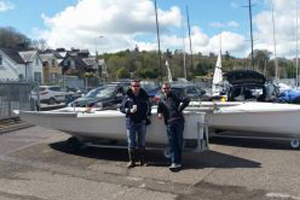 The Barry brothers , Colin and Ewan, each took delivery of a brand new N18 dinghy to expand the current fleet of super fast Ultra designs to ten in number. As the class continues to develop at pace, the fleet will travel to Baltimore this coming June weekend to compete in their south coast championship . Both the ultra and ultimate designs will compete side by side as the fleet continues to transition over the coming year, with the new design continuing to move centre stage to take the class forward in line with advances in design technology. 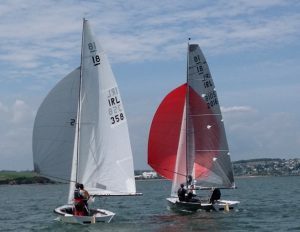 League racing continues every Wednesday evening throughout the summer and new editions to the fleet are very welcome.